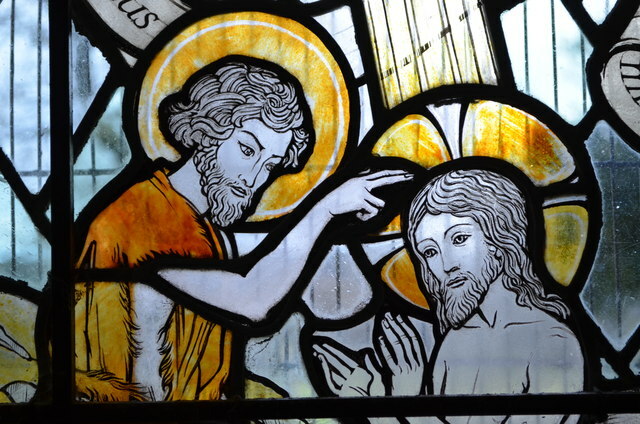 John the Baptist and Jesus by Martin Travers, 1924. "Hic est filius meus dilectus in quo mihi complacui"
Mountfield is mentioned in the Domesday Book of 1086, but there is no mention of the church the most likely reason for this is the village is only 3 miles from the site of the Battle of Hastings, and considerable areas in the vicinity were laid waste after the battle. The church was probably originally an oblong nave and a small square chancel. These date from the 12th century. The chancel arch is certainly 12th century. A tower was added around 1200.It was originally unbuttressed. It is lower than the main roof and shorter than the broadly proportioned shingled broach Spire. Inside the tower is an old open wooden staircase made in the 16th century, the treads are formed of oak blocks. There are four periods of wall paintings in the church, the oldest being 12th century which are almost completely lost. The 13th and 14th century paintings consist of flowers and monograms which were painted over a masonry pattern. The 10 Commandments were painted in the late 16th century although only 2 are decipherable "Thou shalt not commit adulterie" and "Thou shalt not steale". The south porch is 14th century and is similar to the one at Etchingham. Indeed Sir William de Etchingham held the manner at Mountfield around the time it was built. Their arms are on the label stops of the southwest nave window. There is a large 12th century tub font which was later carved in the 16th century. This was quite a common practice at the time. There are two hagioscopes in the chancel wall. There is a West Gallery which was erected in 1840 and enlarged in 1896 to house the organ made by Walker, which was built in memory of Lady Brassey and opened on Easter day 1896. I just wanted to commend that I knew Jessie Butters from Mountfield well, and AJ Butters was not her elder brother. Nor was he the son of Fanny and William Butters of Mountfield. There was another Butters family in Robertsbridge and it is possible that he was from that other Butters family.